In the era of digital photography, there is one breed of camera which harks back to a bygone era, producing real tangible prints, that you can actually, y’know, hold in your hand. We’re not talking about analogue cameras with 35mm film that you have to wait to be developed - oh no, we’re far too impatient for that - we’re looking at so-called “Instant” cameras. The past few years has seen somewhat of a revival of these quirky little cameras, and in 2019, there’s actually a heck of a lot of choice if you fancy picking up one of these kooky little gadgets. It’s not quite as easy to choose an Instant camera as it is a normal camera - it goes beyond the megapixel count and the zoom, often coming down to a “feeling” in a lot of cases. There’s quite a few different ideologies on offer in this list, but if we were forced to pick a favourite, it would probably be the Fujifilm Instax Square SQ6, followed closely by the Leica Sofort. If you’re looking for something small, light and discreet, well, the bad news is that you probably won’t find something like that in the instant market - but it’s good news for those who like to stand out from the crowd. A lot of the cameras here look a little strange - you’ll certainly be garnering lots of looks if you whip one of these out in the park, or at a party. Perhaps the biggest consideration you need to make when choosing an instant camera is the type of film that it uses. There’s a few main options. First off is Instax, which seems to have become the most popular. It’s available in both “mini” and the larger square format. Print quality is decent, while the cameras themselves don’t look so bad either. Next up, there’s classic Polaroid film. Polaroid itself stopped manufacturing the square film you may remember from your childhood (younger millennials, look away now), but it was brought back to life by the Impossible Project, now calling itself Polaroid Originals. The big catch here is that the film is unpredictable (some might say “charming”) in its nature, and it’s very expensive. Finally, there’s “ZINK” (Zero Ink) paper, which you tend to find at the cheaper end of the market. This works by heating crystals in the paper to produce the colours needed for your shot. While it’s cheaper than Instax and Polaroid, it’s also generally poorer in quality. It often seems like instant cameras are relatively cheap - and it’s true that the initial outlay can be not too bad. You need to consider though that every time you take (or print) a shot, it’s costing you money - and in the long run, that can seriously add up. Choosing one “best” instant camera is difficult - since what I like, you may hate - such is the subjective nature of the Instant market. However, the Fujifilm Instax Square SQ6 is T3's favourite. If you want a digital record of your images as well, the Fuji Instax Square SQ10, available for around £220, manages to marry together the convenience of digital, with the lovability of instant, all the while producing the popular retro square format. The Fuji Instax Mini 9 is an alternative option, which is cheaper, and just a little bit more fun. The Leica Sofort comes close to topping our list because it looks so blinking lovely, and is a more affordable entry into the prestigious red dot brand than you might otherwise ever hope for - expect to pick one up for around £250. One of the newest additions to the market is the Lomo Instant Square. It’s the first fully analogue camera to use the square Instax format (Fuji’s offerings are essentially digital, with an inbuilt printer). It’s got a unique look, and cleverly it can also take the Instax Mini Format too. Prices start at £179. Also from the same family is the Lomo Automat Glass, which features a wide-angle, high-quality glass lens and works with the Instax Mini format. The newly renamed Polaroid Originals has an excellent contender for those who want to go seriously retro. The Polaroid Originals OneStep 2 i-Type camera you can pick up for around £110. Finally, there’s the company trading with the old Polaroid name, with its Polaroid Snap Touch - a camera which uses ZINK. This one is more of an impulse purchase than something you hope to get high quality prints from, but it’s fun none-the-less. The Instax Square SQ6 from Fujifilm is our favourite instant camera, it's stylish, with a perfect mix of modern and retro looks, simple to use, and produces large square images that just feel right. The camera comes with host of creative shooting modes (including automatic, selfie, macro and landscape modes) and even coloured flash filters. If you want a bit more creative control, you can choose to manually adjust exposure yourself with Lighten and Darken modes, or even create a Double Exposure to super-impose two images into one. This simplicity adds to the fun of the device – just snap away and let the camera pump out reliably pleasing images. You'll be thankful for that reliability, because Square Instax film is almost double the price of the Mini version, so you won't want to waste film. Although the cost of film is a little on the high side, the cost of the camera is not, with an RRP of just £125, making it pretty affordable in our eyes. If your dream of owning a Leica stops short whenever you see the associated price tag, the SOFORT could be the one for you. Available for around £220, this is a bargain basement price to pay for the prestigious red dot. It’s actually also a neat and fun little device, which uses the miniature Instax format, which are roughly credit card sized. There’s no monitor to frame your shots, but you do get a basic viewfinder, and a display which tells you which mode you’re in, how many shots you’ve got left and so on. You take a gamble when there’s no screen as to how your shot is going to come out (and sometimes the results will be a little mixed) - but isn’t that part of the fun? Lomo tends to raise funds to get its gear into production via Kickstarter, with a loyal army of fans getting a good range of cameras, lenses and accessories on the market. One of the latest is the Lomo’Instant Square, which is a fully analogue camera (sorry, no previews) that uses the Instax Square format. Cleverly, there’s also an additional back which means you can use the Mini format too. The foldable bellows design is a little on the unusual side, but nobody buys a Lomo to be a wallflower. There’s a range of different modes, but in essence, it’s an automatic camera which produces charming results. With its rounded edge, yet boxy, appearance, the SQ10 isn’t exactly pocket friendly, but by comparison to some of the others available on this list, it manages to appear quite sleek. It’s a hybrid digital and analogue camera, which essentially means it’s a digital camera with an inbuilt printer - this is good for a couple of reasons. Firstly, you can make sure you actually do want to print your shot before you waste your film (and your money), and it gives you a digital backup of your shot should you need it. While the prints are fun and quirky, the fact that the sensor inside is just 3.7 megapixels leads to digital shots which are reminiscent of early smartphones (i.e. not that great). If you like the look of Instax, but want higher quality digital shots, take a look at the Instax Square printer which uses the same film, but allows you to print from any camera you like (via your phone). 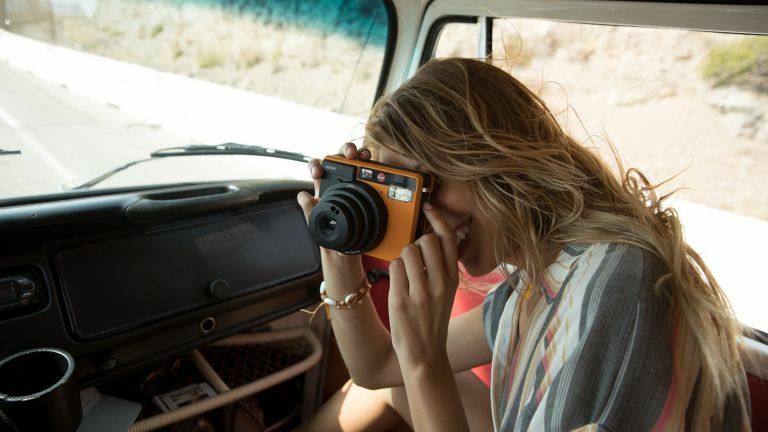 This simple camera harks back to the classic Polaroids that many of us fondly remember. Except now it has some modern twists, such as a USB port for charging the battery. While the outlay for this camera is pretty cheap, Polaroid Originals film certainly isn’t - and it almost feels like you’re being charged for the privilege of unpredictability and instability. Some may say that’s part of the charm, but be prepared to part with some serious cash as you learn about the quirks of a camera like this. Worth it though, for the quirky shots it’s capable of producing - as well as the nostalgia holding one of these in your hands provides. Pick up the different coloured film packs (including gold, silver and bright colours) to add even more fun. Available in an array of suitably trashy colours, the Instax Mini 9 is a fun way to liven up a party. It accepts the teeny tiny Instax Mini film, which arguably is a little gimmicky, but never the less fun for producing keepsakes from special events - we’ve often seen these cameras lying around on wedding tables. There’s no monitor here, so the results are a little unpredictable, and you’re definitely going to need the flash when shooting indoors - but it’s certainly quirkier than using your phone to take snaps. One of the biggest selling points here is both the affordability of the camera and the associated film - pick one up on a whim, even if it doesn’t get too many outings. Another of Lomo’s Instant range is the Automat Glass, which features a good glass lens to boost the quality of your shots. This is a fully analogue camera, so you’ll have to take a leap of faith that the shots will come out right - most of the time they do - using the ever-popular Instax mini format. This is one of the most affordable cameras in this list, but the small format film can quickly become gimmicky if you’re not careful - still, with the fully automated operation, this is a very easy camera to use for those that fancy a dabble in instant photography. Trading on the Polaroid name, but having nothing to do with the Polaroid of old, the Snap has a couple of other things going. First and foremost is the sleek design. There’s a number of nice touches, such as the magnetic lens cap, and the curved edges. Unlike the original Polaroid Snap, there’s a touch-sensitive screen here, with which you can preview your images, choosing not to print out the duds at all. Unsurprisingly for a cheap camera, the screen quality is on the low side. ZINK is much cheaper than Instax and Polaroid, but on the flipside, the quality of prints is lesser, and don’t hold nearly as much charm as those from the rivals listed here.